Prem Rawat has shown a great commitment to the UK ever since he first came to the West from his native India in 1971. As well as public presentations of his message, he has spoken at various conferences, seminars and meetings. In total Prem Rawat had undertaken over 370 speaking engagements in the UK since 1971. The audience numbers for all his speaking engagements in the UK to date totals nearly 800,000. Prem Rawat has shown a great commitment to the UK ever since he first came to the West from his native India in 1971. His first ever speaking engagement was at a private house in London to an audience of 15 on the 17th June 1971. In the same year he also made a guest appearance at the Glastonbury Festival in 1971, attended by over 10,000. His largest audience in the UK was at the Lingfield Race Course when over 12000 attended. As well as public presentations of his message, he has spoken at various conferences, seminars & meetings. In total Prem Rawat had undertaken over 370 speaking engagements in the UK since 1971. 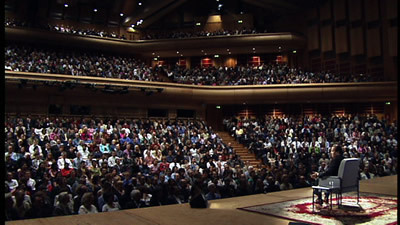 The list of venues where Prem Rawat has given addresses reads like a listing of the major conference facilities in the UK: – the Grand Hall of the Guildhall in London, the Barbican Theatre, the Royal Albert Hall, the Brighton Conference Centre, the Wembley Conference Centre, the Wembley Arena, the National Exhibition Centre, the National Indoor Arena, the Manchester Free Trade Hall, Birmingham International Conference Centre, Colston Hall in Bristol, Alexandra Palace, the Nottingham Ice Arena, the Harrogate International Arena, the Edinburgh Assembly Rooms, the Manchester Evening News Arena, the Ascot Pavilion, De Monfort Hall In Leicester, the Sheffield Arena, Nottingham Royal Concert Hall, the Congress Theatre in Eastbourne, Apollo Theatre Manchester, Theatre Royal in Nottingham, Edinburgh Town Hall, Leicester Absara Hall, Granby Hall Leicester, London Olympia, Ecumenical Hall, Notting hill Gate, London Central Hall, Porchester Hall & London Conway Hall. He has also spoken at Oxford University, Exeter University & Imperial College, at many Town Halls - Hove Town Hall, Wandsworth Town Hall, Fulham Old Town Hall, Hornsey Old Town Hall, Ealing Town Hall, Acton Town Hall & St Pancras Town Hall as well as at numerous hotels across the country. The audience numbers for all his speaking engagements in the UK totals nearly 800,000.